No easy answer but, “it’s the largest shopping experience you will ever go on in your life.” Examining all of the facets of a construction project can be compared to a puzzle with some of the pieces not quite fitting correctly and finding a way to jam them together. And a famous quote comes to mind every time I touch upon this topic by Karl Jaspers – “Even scientific knowledge, if there is anything to it, is not a random observation of random objects; for the critical objectivity of significant knowledge is attained as a practice only philosophically in inner action”. Let me start with a little background about me, my name is Marc Scavuzzo and I am a Principal of T.M. Design Associates, Architects P.A. and Scavuzzo & Associates P.A., General Construction. My background is in Architecture for the past 18 years, a general contractor for the past 4 years and a newly acquired Master’s degree in Accounting. I am involved in every facet of the construction project, from planning to the budgeting to construction to completing the project. 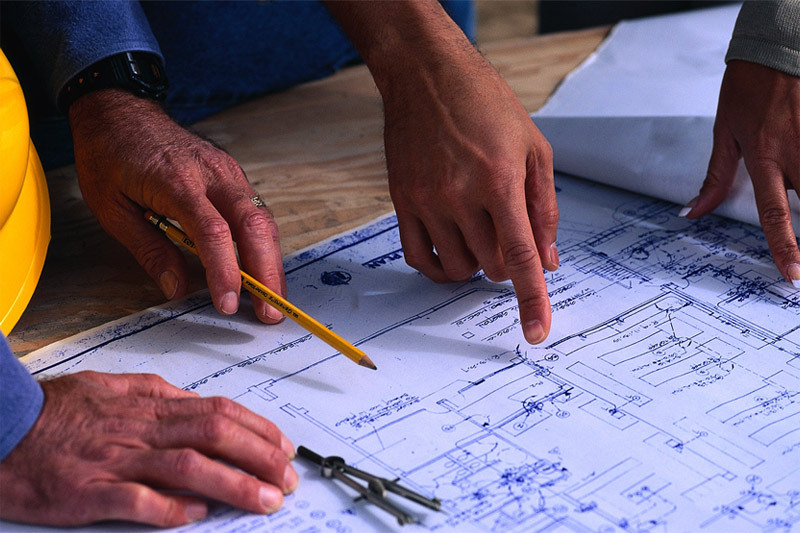 Once your plans are complete, I cannot stress enough upon reviewing them, ask questions; know what you are building. Once the plans are complete the municipal review starts and depending on the city, county or state this process varies. So, allow enough time to obtain a permit and once that’s issued the fun starts. I would, however, offer a piece of information: when you are assembling a table, if the instructions don’t offer a clear description of the installation; it will make it difficult to assemble. Well, the same goes with construction, the better the quality of the construction drawings, the less anxiety during construction. Hire a good Architect! For renovations, ask for references…visit some houses that they designed; be informed before making that decision. As the contractor, a big responsibility is hiring the subcontractors who will do the work. You on the other hand will start with the usual suspects. Who do you know who had some work done on their house? Who did they use? Was it done on time and within budget? Talk to subcontractors you’ve already vetted. If your carpenter recommends an electrician he works with frequently (and it’s not his ne’er-do-well brother-in-law), that’s a solid lead. If you’re using a project manager, have him help you. Once you get a handful of subcontractors you like (three to five), start penciling in what your picks will charge to do each job. And remember that the low bidder doesn’t necessarily do the best work. One other wrinkle: The builder’s crew normally does the framing. But since you’re the builder, you have to find a subcontractor who will do it for you. Another point to consider: Do you want subcontractors to buy the supplies or do you want to do it yourself? There is no set answer, and the standard practice can vary with the professional, the trade and even the area of the country. “It’s a mixed bag,”. So, Mr. Handyman, you think you’re ready to build your own house. Or at least to supervise the people who do the actual construction. You want to be your own general contractor and hire the subcontractors, set the schedules, coordinate with inspectors and suppliers and buy some or all of the supplies. Maybe you should think about it some more. C. Kent Conine, past president of the National Association of Home Builders, is not a fan of the practice. “There are just so many pitfalls that come up in the middle of the process of constructing a home,” he says. “It’s not a perfect science.” And the study of the building sciences is not easy as you would think. This is will be the most important part of this passage. Getting the most out of your money and the least amount of headaches and sanity by the end of your construction project. I can once again say, no easy answer but there is. The most knowledgeable person on your team is your Architect and many Architectural firms are now offering construction services and will work with your selected sub-contractors. An architect will be more conscience of detail and quality i.e. how the project is being built. A contractor will on the other hand does not possess the educational background and will at times make the mistake first and then call the Architect after a failed inspection to find a resolve. Thorough the years I have compared various contracts with clients that have a building contractor/Architect scenario and an Architect/Builder scenario office that does both. I normally see a 20% savings on the General Conditions costs and an 80% decrease in change orders. Professionals agree on how much you stand to save. While some claim you can cut as much as 40 percent of the cost of your home (especially if you do some of the work yourself, too), others believe 10 to 20 percent is more realistic. Before you build anything, you need a clear picture in your own mind. Tour homes. Read books and magazines. Look at floor plans. Start a scrapbook with information and notes on all the details you want to include before sitting with your Architect. This also is when you want to learn about the building process. Study up on the latest materials and supplies, as well as what goes in when. Building a house is like reciting the alphabet, and the order of the steps is just about as immutable. This also might be the time to weigh hiring a building professional, under a management contract, to help you. This person would cost less than a general contractor, and could walk you through parts of the project where you feel inexperienced. Draw up a plan of action that includes each step in the process. “Storyboard it out,” Woodson says. As a builder, the biggest responsibility is hiring the subcontractors who will do the work. Start with the usual suspects. Are they all licensed? Workman’s Comp? How many project they have previously done with the builder? Drive around neighborhoods you like and find out who’s doing that work. Talk to subcontractors you’ve already vetted. If your carpenter recommends an electrician he works with frequently (and it’s not his ne’er-do-well brother-in-law), that’s a solid lead. If you’re using a project manager, have him help you. Once you get names, you want to learn all you can. Google them. Get a long list of references and talk to them. Examine past work in person. Arrange to meet them on a current job site. Once you get a handful of builders you like (three to five), start penciling in what your likes and dislikes. And remember that the low bidder doesn’t necessarily mean the best value. At times Builders will intentionally price low and find ways to get extra money throughout the project or use inferior materials. Remember, you will pay either way. So, Mr. Handyman, you think you’re ready to build your own house and hire the subcontractors, set the schedules, coordinate with inspectors and suppliers and buy some or all of the supplies. Maybe you should think about it some more. The idea, of course, is to save the cost of a general contractor. “If you’re really savvy, you can get more bang for your buck, hire an Architect/Builder. You will get experience as well as quality construction at a good price and save a lot of money,” says Robert Irwin, author of Tips & Traps When Building A Home. If you are building a new home, adding to your existing home or a commercial project in the South Florida area, give us a call as we offer FREE Construction Planning and Consulting.